Stay connected with Marshall and its growing social media channels. The unique capabilities and expertise found at NASA's Marshall Space Flight Center are being used to develop and operate the engines, vehicles, space systems and science payloads which NASA will use to conduct unprecedented missions of science and discovery throughout our solar system. Building on the best propulsion technologies from the space shuttle, the Apollo-era Saturn rockets and several other NASA programs, Marshall is developing NASA's advanced, heavy-lift Space Launch System -- the most powerful rocket ever built -- designed to enable crewed exploration missions beyond low-Earth orbit to destinations across the solar system. 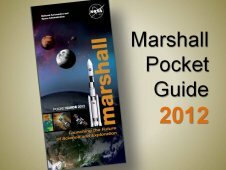 The Marshall Center manages and will deliver the systems needed for the next generation Space Launch System, or SLS -- development of which began in earnest in September 2011. The SLS program is developing the nation’s next advanced, heavy-lift vehicle -- the most powerful rocket ever built. Its design maximizes efficiency and minimizes cost by leveraging investments already made in legacy launch hardware and systems, while also using evolutionary advancements in launch vehicle design. The initial launch vehicle configuration will have a lifting capacity of 70 metric tons. The rocket will be evolvable to a 130-metric-ton lift capacity and will be built around a core stage 27.5 feet in diameter, which will share common avionics with its upper stages. It will use a liquid hydrogen and liquid oxygen propulsion system, relying on the space shuttle's RS-25 engine for the core stage and the J-2X engine for the upper stage. Dual, five-segment solid rocket boosters mounted to the sides of the tank will provide added power. The design of the dual boosters on later flights will be determined through competition based on cost, performance and interface requirements. The Space Launch System will carry NASA's Orion crew vehicle, cargo, equipment and science experiments to space. It also will provide emergency abort capability, sustain the crew during the space travel and provide safe re-entry from deep space return velocities. Its mission is to provide a safe, affordable and sustainable means of sending explorers on high-value missions to the moon, asteroids and other destinations in the solar system. Additionally, the vehicle will serve as a backup for commercial and international partner transportation services to the International Space Station. NASA intends to launch the first, full-scale test flight of the Space Launch System by late 2017. Engineers and technologists at the Marshall Center deliver highly skilled, crosscutting engineering services -- the backbone to mission success -- in support of Marshall programs and projects across the center and throughout NASA. Their work serves both the current and near-term planned agency missions as well as efforts still on the drawing board, awaiting the necessary development and maturation to support NASA’s future exploration goals. The center's capabilities include integrated modeling and simulation; developing, testing and integrating launch vehicle systems; developing propulsion systems and components; developing propellant management, storage and delivery systems; and designing automated rendezvous and capture systems. With these capabilities, Marshall is poised to support a broad range of space programs. Marshall Center researchers and engineers develop products for science investigations, conduct verification and integration of state-of-the-art spacecraft and vehicle systems and research and develop propulsion elements for space transportation systems. They provide research, technology and engineering support in materials, processes and products to be used in space exploration and manufacturing; and perform materials diagnostics and failure analysis for NASA and other customers. They manage the functions, resources, services and facilities necessary for simulation of aerospace environments and flight-like conditions; perform research, development, qualification and acceptance testing of flight and non-flight aerospace hardware; analyze and develop requirements for flight and ground systems; and manage ground and flight operations, including day-to-day science operations on the International Space Station. The Technology Demonstration Missions program exists to mature revolutionary, crosscutting technologies to flight readiness status through projects that perform relevant environment testing. Once a technology has been proven in the laboratory environment, the program allows an opportunity to "bridge the gap" from laboratory to flight -- providing an opportunity for system-level technology solutions to operate in a realistic space environment, where they will gain operational heritage and reduce risks to future missions by eliminating the need to fly unproven technology solutions. The Technology Development Missions Program Office at Marshall is overseeing nine Technology Demonstration Missions with the potential to transform the way we live and work in space. Marshall team members participated in the development of the Space Technology Roadmaps, a set of 15 documents that chart the development of multiple technology areas. These roadmaps will help NASA identify new technology development opportunities, enable planners to integrate new and innovative technologies into future flight programs, and prioritize the agency's technology development investments for years to come. Marshall's expertise opens the door to scientific discoveries, helping NASA find the critical intersection of science and exploration. Since the early days of the space program, the center has increased human understanding of the universe through its contributions to heliophysics, astrophysics and planetary and Earth sciences. Scientists at Marshall are studying everything from the birth of planets and the death of stars to the inner workings of hurricanes and other global climate conditions. Their scientific breakthroughs in space will enhance life on Earth by helping farmers improve agricultural methods and enabling governments to manage water resources more effectively. Other benefits for humankind include more accurate worldwide weather forecasting and tracking of dramatic environmental change and the development of numerous, sophisticated tools and solutions that can be applied to tasks on Earth. The Marshall Center has a critical role in moving the nation forward with its renewed focus on space exploration and scientific discovery. Learn how Marshall's strengths and proven capabilities support NASA's goal of integrating science and exploration in innovative ways for maximum return on the nation's investment. Learn more about Marshall's vital roles in America's space program. Published online every Wednesday, the Marshall Star is the Marshall weekly newspaper. A fascinating look at the complex, challenging work at Marshall, and how its talented, dedicated team supports NASA goals. 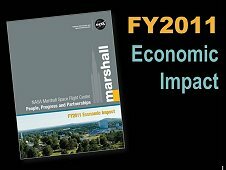 Marshall's impact on the nation, state and local communities -- jobs, education, technology, and mission success. Meet the many different "faces" of the Marshall Center's diversified field of experts. Explore games, videos and websites that will help kids of all ages discover more about the work we do at Marshall. The Marshall Center is a key contributor to significant NASA programs, continuing a legacy of accomplishment. Focus on Marshall is a video update series that highlights capabilities around the Marshall Center. The Marshall Workforce Transition website was developed to provide a single point of access to information on workforce transition for all employees at the Marshall Center.